The stars of Vikenti Nilin’s ‘Neighbours’ series probably come from all walks of life but they have one thing in common: they are staring into their own abyss, conveniently found in the familiar surroundings of the commonplace Soviet tower block. Yet they don’t seem in the least bit worried. Deadpan doesn’t begin to sum up the mood hanging around Nilin’s black and white portraits. 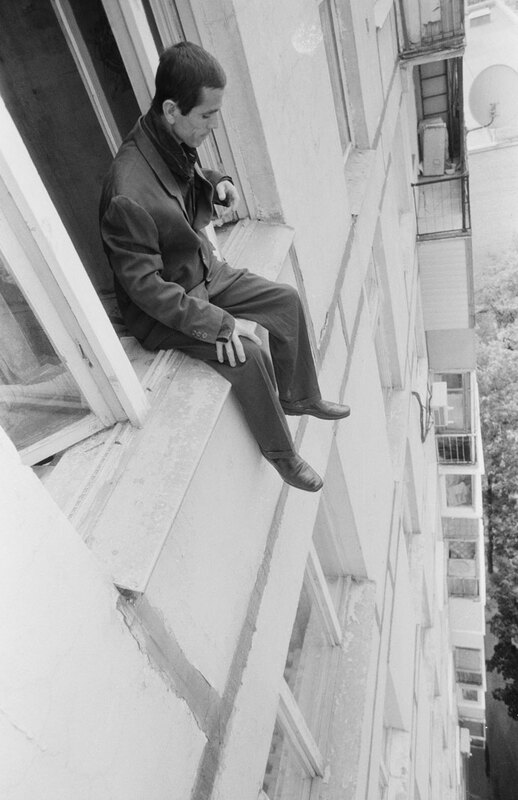 The expressions on his subjects, as they perch on the edge of windowsills and balconies, are phlegmatic, unimpressed, relaxed and almost bored. Vikenti Nilin’s photographs and installations are glacially sardonic, direct and to the point, but their oblique meaning can end up provoking nervous laughter. His images suggest a state of incarnate passivity, suspension and permanent transition, perhaps morosely alluding to the state of politics in his home country.